Yacht Marine central agents for Viudes 45? Pedro Millet Junior at Yacht Marine confirms today that the Barcelona-based company are central agents for the first Viudes 45, due for delivery in 2010. 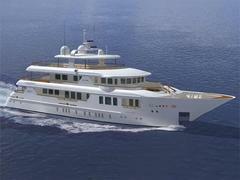 The Viudes 45 is designed by Isonaval Naval Architects and will accommodate six guests and nine crew. At 498GT, she will have a maximum speed of 15 knots and a cruising speed of 14.5 knots with a range of 3,000 nm. “We are working on the first superstructure and also the second superstructure separately,” explains Millet.